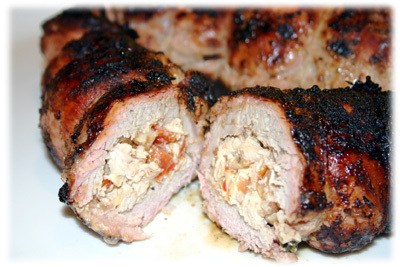 I'm not sure why this recipe for pork tenderloin didn't come to me sooner but I'm sure glad it finally did. 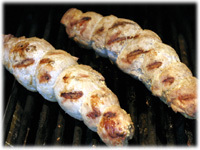 Simply butterfly and flatten a couple pork tenderloins, spread on a little sauce made of dijon mustard, fresh thyme and lemon zest, add a couple whole sausages, roll them up, tie them and onto the grill they go. Choose whatever flavor sausage you like. I first looked for mild Italian and couldn't find any so I chose Bratwurst instead. You can either reserve some of the Lemon-Thyme Dijon sauce or make this new Dijon, White Wine and Tarragon mustard sauce to serve with the pork tenderloin after it comes off the grill. 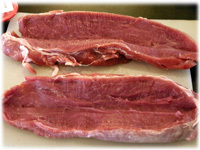 Lay the pork tenderloin flat on a cutting board and carefully slice the length of it without cutting all the way through to butterfly it. 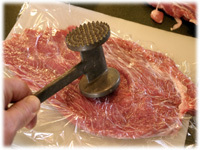 Lay plastic wrap over the butterflied tenderloin and carefully pound it with a meat hammer to flatten it to about 1/2" - 3/4" thickness. 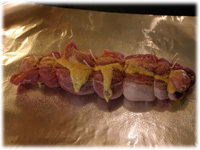 Spread some of the Lemon-Thyme Dijon sauce over the flattened pork tenderloins. 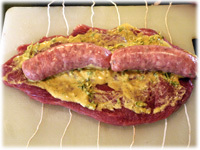 Lay 2 sausages end-to-end in the center on top of the mustard sauce. Carefully roll up the tenderloins and tie with butchers twine about every 1 1/2" inches to secure the sausages and sauce inside. Lay a sheet of aluminum foil (large enough to hold one of the stuffed tenderloins inside) on your counter and spray it with cooking oil spray. 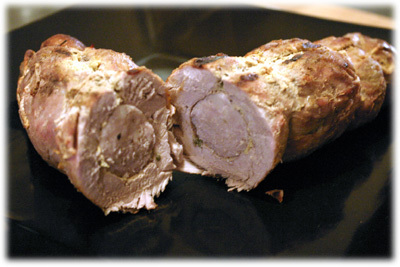 Lay a stuffed tenderloin in the center of the foil and sprinkle it with garlic powder. 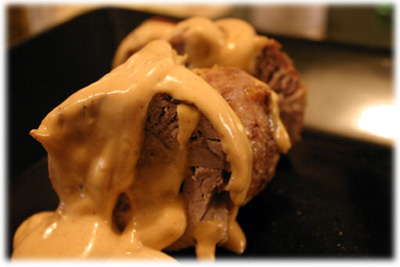 Roll up the tenderloin inside the foil so it's completely enclosed. Repeat with the second tenderloin. Preheat the grill to 400F - 425F. When it's reached this temperature range place the foil packs on the grill and close the lid. 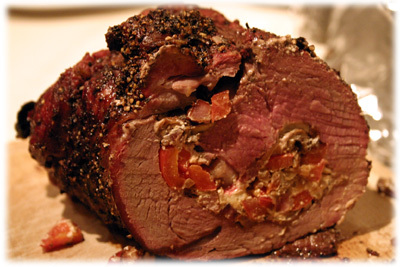 Roll each foil wrapped tenderloin a 1/4 turn every 5 minutes to ensure even cooking. 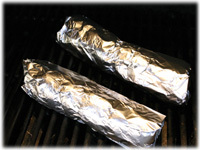 After 25 minutes open the foil and remove the tenderloins directly to the grill. Keeping rolling each tenderloin a 1/4 turn for another 8 - 10 minutes to brown up the outside. Remove when the internal temperature reaches 150F and cover with foil for 5 - 10 minutes to rest. Remove the butchers twine and slice into medallions. Serve with reserved Lemon-Thyme Dijon sauce or this Dijon White Wine Tarragon sauce found here.